← How Can Reiki Energy Help you? 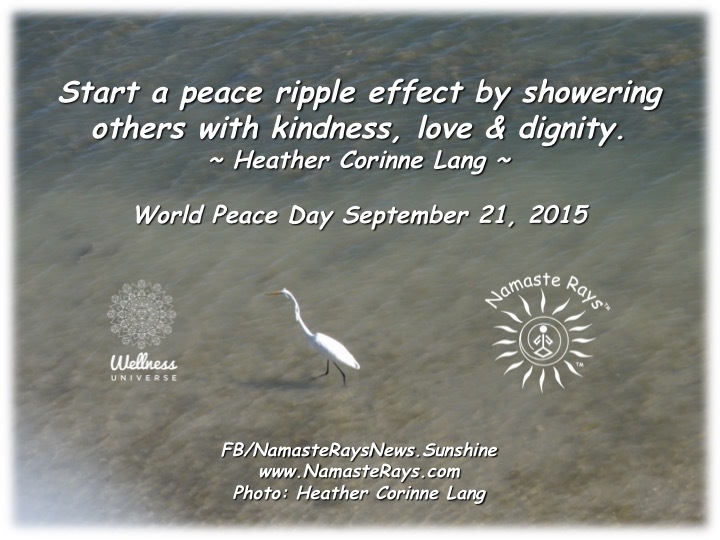 Start a peace ripple effect by showering others with kindness, love & dignity. Help create the ripple effect! As we create inner peace, and continue to show others peace, kindness, love, compassion, respect and dignity, it radiates the energy out, helping to create a ripple effect to those you may not even know. Apologize to someone, help someone in need, donate to a shelter, smile at strangers, sit in solitude & prayer for peace at noon your time on Sept. 21 & light a candle and/or spread the word of peace in your unique way. The more we each work towards cultivating our own inner peace through healing our issues to awaken, transform and evolve, we show the way to others. We can then act in a peaceful, more loving way to each person in our lives and as we come across others in our daily activities. This creates the ripple effect! When we act in a certain way, others can pick up this energy, then radiating it to others. Like a kindness act, being more peaceful to ourselves and others make both us and them feel better. When we feel better, we act in more compassionate and loving ways more often. Continuing to do this strengthens the peace within, helping to keep us in a balanced state, further awakening us to our healing journeys, allowing us to transform ourselves and evolve into a wiser being. Again when others see and feel these actions in us, it ripples that energy outwards to them and to others they touch in their daily lives. Changing the World to one of Peace & Love, truly begins one person at a time. Remembering we are all One of the Divine Light,as well as, unique expressions of the Divine Light, it brings us into the realization that what we do for ourselves, we do for others. Heal ourselves, helps others heal. Transform ourselves, helps transform others. Being at peace, helps others be at peace. What we send out, is returned to us at threefold, therefore, be acutely aware of what type of energy you are sending out, letting the energy be one of peace, honor, respect, dignity, compassion, kindness, love & light. Members of The Wellness Universe have c0me together to help ripple this energy to the World in our unique ways. Please visit this link and see the video and all the lovely posts encouraging participation in World Peace Day. We would appreciate your comments on what activities you plan that day, and to help us spread the word by sharing, tweeting and pinning the page. Let us all help that ripple of peace to become a tidal wave, covering the entire planet each and every day. If you would like help on your healing journey, please contact me for more information or an appointment for Reiki energy, an Akashic record reading, Intuitive Guidance session or a Tarot/Oracle card reading. I would be de-LIGHT-ed to guide you in any way I can!